Napoleon rose to power in the aftermath of the French Revolution and in the midst of a world at war. He was, writes Zamoyski, “in every sense the product of his times [and] in many ways the embodiment of his epoch.” His success, the author contends, was not the result of genius but rather of his immense will to power and insatiable ambition. Those factors also contributed to his failures and ultimate demise. Born in August 1769, the young Napoleon was a voracious reader, with a special interest in geography and history. Zamoyski examines his upbringing on the island of Corsica, his education at the military academy of Brienne and the Ecole Militaire in Paris. He was to some extent shaped by the intellectual and political currents that surrounded him. He read Machiavelli, Rousseau and Goethe. He studied the lives of Alexander the Great, Julius Caesar, and Charlemagne. Zamoyski notes that Napoleon frequently wrote annotations and comments in his books, and drafted essays that critiqued different political systems. The anarchy and subsequent terror of the French Revolution, Zamoyski notes, “dispelled any faith [Napoleon] might have had in the inherent goodness of human nature.” “The dreamy romanticism of his youth had been confronted with the seamy side of human affairs . . .” Napoleon became a “cynical realist” who understood the fragility of life and political systems. He first demonstrated an ability to successfully command troops at Toulon in 1793. France was at war with much of Europe. Its harbor at Toulon was controlled by British, Spanish, Sardinian, and Neapolitan troops. Napoleon laid siege to the port. “He showed bravery and steadiness under fire,” writes Zamoyski. His self-confidence had a “magnetic” effect on French troops. French forces took Toulon, and Napoleon, at the age of 24, was promoted to brigadier general. “He had proved,” notes Zamoyski, “not only that he was a capable and successful officer, but also that he was a leader of men.” His military star was rising. In late 18th century France, this made Bonaparte an asset and a danger. In 1796, he was given independent command of France’s Army of Italy. There he commanded officers such as Andre Massena, Charles-Pierre Augereau, and others who would one day become his trusted marshals. He and his army won victories at Lodi, Milesimo, Castiglione, Bassano, Arcole, and Lonato. He marched on Vienna, forcing the Austrians to sue for peace at Leoben. He seized Venice and set up a puppet government. Napoleon was making both military and political decisions beyond his formal authority from the French government. “He was now both feared and needed by the [ruling] Directory, and by every political faction in Paris,” notes Zamoyski. Napoleon was now master of Italy. He wanted to be master of France and much more. He had succumbed to hubris, which in time would lead to nemesis. Egypt and Islam disabused Napoleon of those beliefs. He learned there that fear worked better than reason or ideals. He razed whole villages when his troops were attacked. He took hostages and had other suspected opponents beheaded. France was bedeviled by both internal and external foes. The Revolution had unleashed ideas and forces that produced chaos in France and threatened to upset the European balance of power. Napoleon sought to impose order at home so France could achieve his ambitions abroad. He gained key political allies in France, including Tallyrand and Fouche, who would later serve him in important positions and then betray him. The Directory was overthrown and a Consulate was formed in 1799 to lead France, with Napoleon as first consul. Soon he was effectively dictator of France, imposing censorship, purging enemies, and consolidating power. The other European powers unsurprisingly resisted Napoleon’s ambition. In a series of famous battles—Marengo, Austerlitz, Ulm, Jena-Auerstadt, Lubeck, Eylau, and Friedland, Napoleon bested his major continental rivals. But Great Britain still controlled the seas, especially in the wake of Trafalgar where Nelson defeated the French and Spanish fleets. Napoleon’s hubris eventually provoked all of Europe to oppose him, including forces within France. His disastrous Russia campaign (1812-1814) resulted in the allied occupation of France and his banishment to Elba. In 1815, he escaped Elba, reunited elements of the French army, seized power, and suffered his final defeat at Waterloo. This time, the allies imprisoned him on the isolated island of St Helena in the South Atlantic, where he ended his days in frustration and despondency, blaming others for his failure. He died there in May 1821. 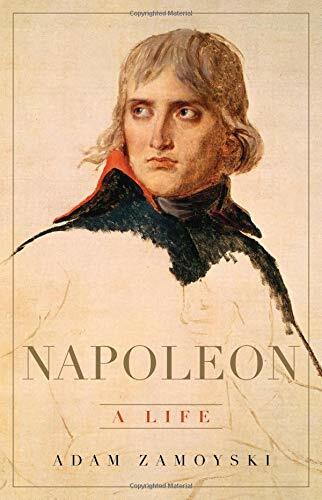 Throughout the book, Zamoyski tells the personal side of Napoleon’s life—his complicated relationship with his immediate family, his adolescent loves, his marriages to Josephine de Beauharnais and Marie Louise, his relationship with Marie Walewska, his friendships and political rivalries, his hopes, his dreams, his self-doubts.